RIGA, Latvia - Prime Minister Justin Trudeau said Tuesday that Canada is extending its NATO commitment in Latvia by another four years to March 2023 and will boost the number of troops in the country to 540 from the current 455 in a show of ongoing solidarity with the alliance. Trudeau made the announcement in Riga following a meeting with Latvian Prime Minister Maris Kucinskis and indicated that he hopes the increased Canadian commitment to Latvia gets the attention of Russian President Vladimir Putin. Canada is part of a NATO battle group in Latvia, which was established as the alliance's response to Russia's surprise annexation of Crimea in 2014 and its invasion of eastern Ukraine. "We certainly hope that the message is passed clearly to President Putin that his actions in destabilizing and disregarding the international rules-based order that has been successfully underpinned by NATO amongst others over the past 75 years or so is extremely important," said Trudeau. "We certainly hope that Russia will choose to become a more positive actor in world affairs than it has chosen to be in the past." The Canadian-led group is one of four in the region, and includes troops from seven NATO allies. Germany leads a similar force in Lithuania, Britain leads one in Estonia and the U.S. leads in Poland. Before leaving Canada on Monday, Trudeau spoke to NATO secretary general Jens Stoltenberg by telephone to stress the "importance of the alliance's unity and solidarity on defence and security issues." Trudeau's announcement comes a day ahead of a NATO summit in Brussels, where the stage is set for another confrontation between world leaders and Donald Trump, as Canada and other NATO allies prepare to counter the U.S. president's complaint that they aren't carrying their fair share of the burden of being part of the military alliance. 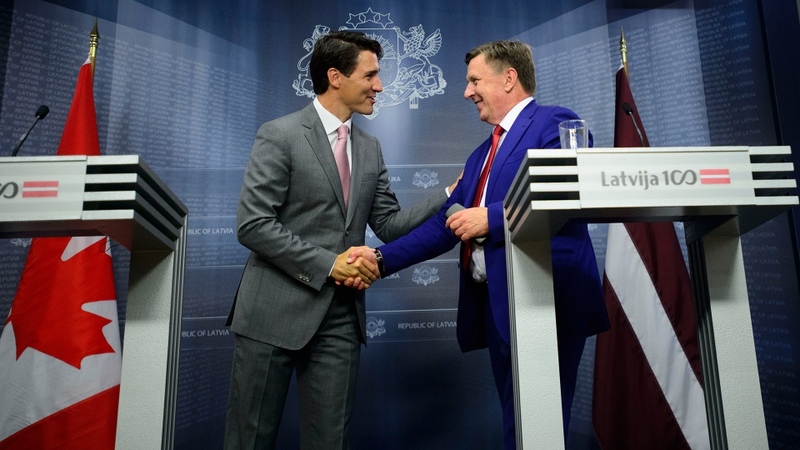 Trudeau also met in Riga Tuesday with Latvian President Raimonds Vejonis. He also laid flowers at the monument of freedom and took part in a number of activities at a military base in Adazi. Trudeau also attended a candlelight vigil at a Latvian memorial to fallen soldiers, a vehicle display by multinational troops and spoke to Canadian military personnel. Trudeau's visit to Latvia comes as the stage is set for another confrontation between world leaders and Donald Trump, with Canada and other NATO allies preparing to counter the U.S. president's persistent complaint that they aren't carrying their fair share of the burden of being part of the 69-year-old military alliance. Trump's ongoing efforts to portray Canada and other member states as pinching pennies when it comes to the military spending target of two per cent of GDP - a benchmark agreed to by allies at the 2014 summit in Wales. Trump has threatened to pull out of the alliance entirely if other member nations don't pony up. The president acknowledged Monday on Twitter that other member states have increased their defence spending, but repeated his complaint that the U.S. contributes far more than other countries, which he said "is not fair nor is it acceptable." If the U.S. were to leave NATO, it would have a "huge and highly negative" affect on Canada, said David Perry, a senior defence analyst with the Canadian Global Affairs Institute. "If you take his rhetoric at full value ... it would actually start to undermine the solidarity alliance, it would be hugely consequential for Canada because NATO has been so important to it." Having a forum in which Canada can engage in discussions about key security issues with the U.S. as part of a larger alliance of nations also offers Canada some counterweight that doesn't exist in North America alone, where the United States is the "800-pound gorilla," Perry added. But given that Trump has followed through on other threats - including tariffs on steel and aluminum imports from Canada and the European Union, as well as a full-blown trade war with China - Perry said allies ought to be concerned about the possibility that Trump isn't bluffing. "He does seem to have a habit of doing what he says he's going to do." Concerns about U.S. disengagement have also deepened given that Trump is scheduled to meet with Russian President Vladimir Putin just days after the summit. Some see the controversial meeting as an undermining of the alliance itself, considering some of NATO's active military missions - including the one in Latvia - were undertaken in direct response to Russia's escalating aggression in the Baltic region. "The Trump-Putin summit could potentially aggravate U.S. allies who want to isolate Putin," said Jayson Derow, a research analyst at the NATO Association of Canada. "However, while U.S. President Donald Trump's rhetoric has surely shaken the confidence of U.S. allies and NATO members across the Atlantic, the alliance is still standing and the Trump administration has taken tangible steps to bolster the alliance and European security, while countering Moscow with the sales of military hardware and its own deployments in eastern Europe." #Breaking: Canada will continue to lead NATO battlegroup in Latvia until March 2023. Mandate was set to expire March 2019. Also, number of CAF members deployed to Latvia will increase to 540 from the current 455. Still unclear when additional Canadian troops will be deployed to Latvia or how long into the extended mandate it will take to reach the 540 figure.